I feel like a bat. I spent some time hanging upside down tonight and let me just say . . . ahhhh. My friend Heidi let me borrow her Teeter Hang Ups F5000 Inversion Table and after a few minutes of watching FavoriteSon finagle it into the back of my van, we got it home, adjusted it for my height and weight and I spent some time hanging. Twice. So let me say again. ahhhh. I went to see my doctor on Thursday, and he believes I have a ruptured disc in my neck. I’ve been on some serious cortosteroids and a nightly muscle relaxant. Before Thursday, there was numbness and tingling from my neck to my fingertips on my right arm and hand. My doctor, an osteopath (they also do chiropractic care) performed some serious neck cracking. And some more. And some more. ahhhh. I’m not sure what happened, but I would bet it started with sorting hundreds of books at the Whale of a Sale. Then I upped my cardio workout by including some jogging. I had been walking 3 to 5 miles a few times a week, but for the last four weeks, I’ve been doing interval training. I would jog for about 30 to 45 seconds to increase my heart rate and then walk for a few minutes. Rinse and repeat a few times in my 30 to 60 minute walk and I thought I was doing pretty well. I was jogging longer without wimping out. Unfortunately, my neck and arm pain, the numbness and the tingling were getting progressively worse. And for some stupid reason, I didn’t make the connection. The neck, shoulder and arm pain aren’t new. I have arthritis in my neck, stemming from an old MBA injury. It was 1994. There was a full book bag hanging on one shoulder and a prehistoric laptop (which weighed as much as a dinosaur) hanging from the other shoulder. There was wrenching and pain. A doctor visit and muscle relaxants. Over the years, there have been stupid choices, resulting in a few days of rest (on muscle relaxants). And for the last few years, there’s been arthritis. But the numbness and tingling made me nervous. Doc says that if I’m not feeling better in 10 days, I have to have an MRI. I HATE those. Listening to a jack hammer while I’m trapped in a torpedo tube is NOT my idea of a good time. If I have to have one, I’m finding one of those open MRI places. But I digress and the muscle relaxant is kicking in. What was I saying again? And just a few notes. First, no, that is not me in the Pronex device. That is not how I look when I’m in traction. That is not the facial expression of anyone in traction. Secondly, I did NOT pay $339 for mine. They were even more expensive before the Pronex II came out. Back then, they were $450 and you know I am WAY to cheap to pay that much. I got mine on eBay for $80. Somebody was in a car accident, completed treatment and then sold it. Back then, you were supposed to get a doctor’s prescription for it. (I don’t know about now.) I figured his order to go to a physical therapist for traction twice a week was close enough. So in addition to all that, now, thanks to Heidi, I’m also hanging upside down like a bat. Does anyone know how to blog upside down? Want to learn “what works” for lots of different people? Click on over to Works for Me Wednesday hosted by Shannon at Rocks in My Dryer! ← Would You Like Chocolate With That? Chocolate Speed Painting. With a spoon. How can you be so interesting?! I thought the hanging upside down stuff was only on TV – I honestly didn’t think anyone actually owned one and you have a friend who loaned one to you. 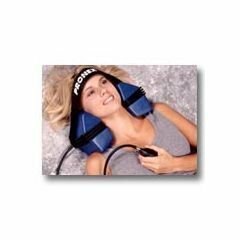 Then that traction device – I can’t imagine trying to sleep with something like that strapped on to my head and here again, you have one. I am so happy that you are going to do all that is asked of you because as you know, being in pain is NOT something you want to continue. I hope you can sleep, I hope you can rest, I hope you can blog, I hope you can eat and be yourself as much as possible and I hope you feel better soon. Kristin – Oh, you don’t sleep in traction in that thing. Oh, no. It’s about 15 minutes, once or twice a day. It fits between your jaw and your collarbone and the black part is a baffle, which fills with air as you pump the little bulb. It doesn’t hurt, it’s just not comfortable. It only feels great AFTER you’re done. Saw a chiropractor once…..all that cracking….not for me. I preferred the pain. Oh, this made me hurt just reading it. Not to mention making the blood rush to my head! Linda – Well, I’m not completely upside down, with my head at six o’clock. My head was at about four o’clock when i started and by the time I was finished, it was at about five o’clock. And it actually felt GREAT – no pain. The blood did go to my head and upper body, but in a good way! Really! Sure I know how you can blog upside down! Sit FavoriteSon or FirstHusband down with the laptop and dictate! Easy Peasy! Hope you feel better soon…and how about a doctor telling you NOT to exercise?? Tina – I trust FirstHusband, but who knows what mischief FavoriteSon would get into if given access to my blog. He’s ornery, that one. Yukk! I can feel my blood pressure rising and my brain exploding from the unexpected blood flow. Looks like torture equipment, but then, you were already tortured, huh. Hope all is properly aligned soon. Glad that osteopath is doing some good. I LOVE my chiropractor, but it sounds like my chiro does the same thing as your osteo. Hopefully once you get everything back in place, the muscles will gradually get used to the “correct” position and keep everything where it’s supposed to be. Oh you crazy girl. You are so funny and laughter is the best medicine – no? Well I’m guessing it’s going to take a little more than laughter to get you right as rain again. I hope you heal quickly! I see you located your VCR and it did work since you were hanging like a bat in no time. Of course I am glad it made you feel better. I am in for the inversion party, we will all need sippy cups though so we can have beverages. I totally know that nerve tingling, numbness thing. Still somewhat going on in my leg from my back. Since I carry stress in my back, when those muscles begin to knot, everything else on the right side south of my body also begins to be troubled. Take care, be vigilant with it, and an open MRI is really the best way to go. Keep us updated. Pencil me in for the Inversion party. Thanks for explaining that you don’t sleep in that traction device. I even imagined last night what it might be like to sleep with that thing lol My blog world comes right into my real world!